According to a recent study from the American Society of Plastic Surgeons, a facelift can make patients look 12 years younger. 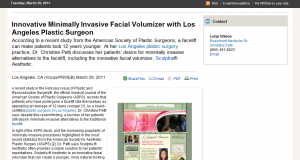 At her Los Angeles plastic surgery practice, Dr. Christine Petti discusses her patients’ desire for minimally invasive alternatives to the facelift, including the innovative facial volumizer, Sculptra® Aesthetic. A recent study in the February issue of Plastic and Reconstructive Surgery®, the official medical journal of the American Society of Plastic Surgeons (ASPS), records that patients who have undergone a facelift rate themselves as appearing an average of 12 years younger. As a board-certified plastic surgeon in Los Angeles, Dr. Christine Petti says despite this recent finding, a number of her patients still desire minimally invasive alternatives to the traditional facelift. In light of the ASPS study, and the increasing popularity of minimally invasive procedures highlighted in the most recent statistics from the American Society for Aesthetic Plastic Surgery (ASAPS), Dr. Petti says Sculptra® Aesthetic often provides a viable solution to her patients’ expectations. Sculptra® Aesthetic is an innovative facial volumizer that can create a younger, more natural-looking appearance with minimal recovery time because of its ability to stimulate collagen production and smooth facial creases and wrinkles. The treatment can also be effective for adding volume to facial features, such as the cheeks or the areas surrounding the eyes, that may have taken on a hollow appearance. Another widely used method of minimally invasive skin and facial rejuvenation at Dr. Petti’s practice is laser resurfacing. She says the SmartSkin CO2™ fractional carbon dioxide laser peel is often effective at smoothing out wrinkles that surgical procedures may not address. Dr. Petti adds that she uses fractional laser peels to refresh the skin of patients that have undergone previous surgical procedures. Ultimately, Dr. Petti says determining the correct procedure requires listening to a patient’s cosmetic enhancement desires so she is able to customize the treatment to their specific goals and expectations. Christine A. Petti, MD, FACS earned her medical degree from the Medical College of Pennsylvania, where she also completed her general surgery residency. She then completed her plastic surgery residency at the University of Chicago Pritzker School of Medicine, where she also served as Chief Resident. Dr. Petti is a member of the American Society of Plastic Surgeons, the American Society for Aesthetic Plastic Surgery, and is a fellow of the American College of Surgeons. She is an avid publisher and presenter in the plastic surgery community, maintains a comprehensive plastic surgery blog, and appeared as a cosmetic plastic surgery consultant on The Doctors, an Emmy award winning daytime talk show discussing the latest medical topics. Palos Verdes Plastic Surgery Medical Center is located at 3400 W. Lomita Blvd., Ste. 307 in Torrance, CA 90505, and can be reached at (310) 961-2530 or found online at www.dr-petti.com or the Palos Verdes Plastic Surgery Medical Center Facebook page.